Jojoba is a shrub native to the Sonora and Mojave deserts. 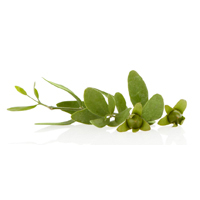 It is grown for the non-comedogenic, antibacterial liquid wax (commonly called jojoba oil) in its beadlike seeds. This waxy substance is rare in that it is an extremely long (C36-C46) straight-chain wax ester and not a triglyceride, making jojoba and its derivative jojoba esters more similar to sebum and whale oil than traditional vegetable oils. In other words, it is not an oil at all. Bearing this remarkable similarity to the oil produce by our own glands, it is well absorbed by and extremely beneficial to our skin for its emollient properties and natural moisturizing factors. It even has some natural sun protection. Jojoba oil is easily refined to be odorless, colorless and oxidatively stable, and is often used in cosmetics as a moisturizer and carrier oil for essential oils. Mexicans and Native Americans have long used jojoba oil as hair conditioner and skin lubricant. It is a particularly effective treatment for "crows feet," wrinkles, stretch marks and dry skin. Additionally for our environment, it has potential use as both a biodiesel fuel for cars and trucks, as well as a biodegradable commercial lubricant.